Many organizations who come to us for help creating a donor wall are new to the design process and are not sure how to get started. 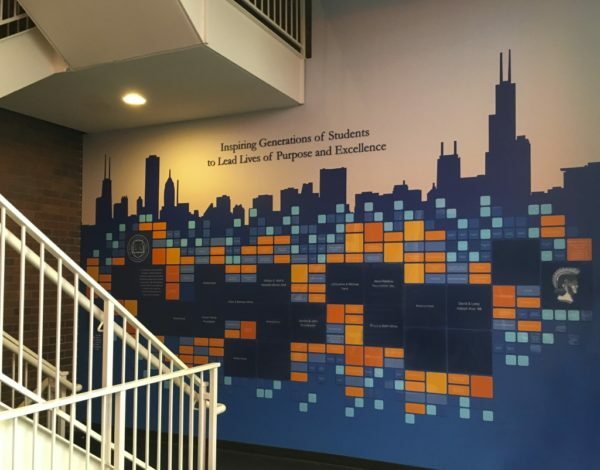 To give you an idea of how a donor recognition wall is designed and installed, we thought it would be helpful to describe how we worked with the Latin School of Chicago to create their donor wall. We collaborated closely with the leaders of the school to design a recognition wall which would not only be functional to meet their future needs, but also reflect the institution’s brand standards and clean cut image. Initially, the Latin School gave us a call without a clear idea of how they wanted their donor wall to be designed; they simply had an empty wall in their facility which they wanted to turn into a donor wall. Once we met with them in person to see the designated wall, we realized it was not an optimum location for the donor recognition display. 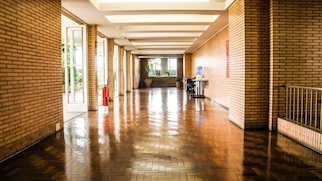 The ideal spot for a donor wall is a large space which has plenty of exposure to visitors and staff, preferably on the first floor of a building. We also try to position donor walls in areas with good lighting and without any obstructions, such as fire alarms, which might disrupt the flow of the display. We worked with the staff of the Latin School to advise them on a better location, and we agreed to use a highly visible wall by the stairwell near the entrance of the facility. When we started designing the graphics and layout of the wall, the school leaders provided their style guide to our designers. The style guide, or brand standards, of an organization generally outlines the preferred fonts, colors, and images for any sort of marketing materials and design projects. We were able to use a silhouette of the Chicago skyline which the school uses across multiple marketing platforms to serve as the backdrop of the display. We printed the skyline image on a seamless wall covering to ensure we could install the entire image in one piece, without awkward breaks. 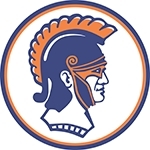 The school’s style guide also provided us with the school’s insignia, their Roman mascot image, fonts to use for the written copy and lettering above the display, and colors to use for the name plates on the donor wall. Although some of the donor recognition walls we design include a finite number of donor names because the wall honors supporters of a particular project, the Latin School asked us to include space they could fill with the names of future donors. At the time we created the donor display, the school had 150 names to incorporate, and they expected to add between seven and ten donors each year over the next fifteen years. To accommodate this request, we cut 300 1/8” inch acrylic name plates in various sizes; 150 of these had names painted on them already, and the remaining were left blank. We strategically mixed the plates with and without names across the wall to avoid any spaces that felt empty, so the nameless plates ended up looking like an intentional part of the design. Most nonprofit organizations are fortunate to have donors who give at various financial levels, and we usually indicate larger gift amounts with increasingly bigger name plates and different background colors. With the Latin School, we took this recognition system a step further by installing a color key in the bottom left corner of the display to explain the various amounts given by each donor on the wall. Finally, we completed the display with dimensional painted letters describing the impact the donors have facilitated with their gifts—inspiring generations of students to lead lives of purpose and excellence. If your organization is looking for a permanent way to thank your biggest supporters, Friedman Fine Art can help you create an attractive donor recognition wall. We provide support to help you choose the best location for the display, design the graphics and layout used, and install the final design. For more information, look at some of our other donor walls, donor wall displays, donor wall recognition plaques and displays or give us a call at 312-666-9797.